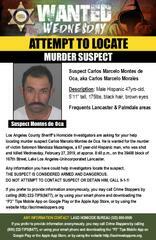 Los Angeles County Sheriff’s Homicide Investigators are asking for your help locating murder suspect Carlos Marcelo Montes de Oca, aka Carlos Marcelo Morales. He is wanted for the murder of victim Salomon Mendoza Mazariegos, a 67 year-old Hispanic man, who was shot and killed Wednesday, February 27, 2019, at approx. 8:40 p.m., on the 39400 block of 167th Street, Lake Los Angeles-Unincorporated Lancaster. Both men lived in separate recreational vehicles on the same property near the house where the shooting occurred. It is believed, that after an argument inside a home on the property, the suspect shot and killed the victim before he fled the location on foot. Suspect Carlos Marcelo Montes de Oca is a male Hispanic 47yrs-old, 5’11” tall, 175lbs, black hair, brown eyes and frequents the Lancaster & Palmdale areas. THE SUSPECT IS CONSIDERED ARMED AND DANGEROUS. DO NOT ATTEMPT TO CONTACT SUSPECT OR DETAIN HIM, CALL 9-1-1! Any information you have, could help investigators locate the suspect.